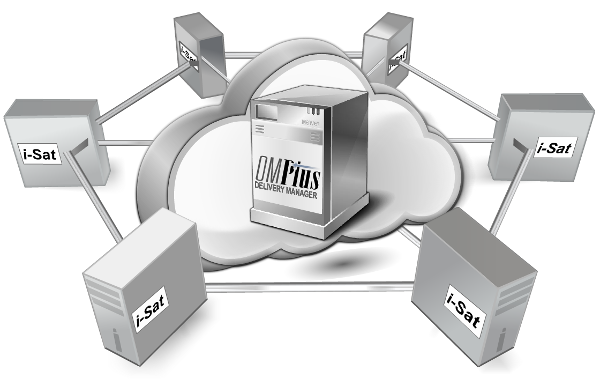 OM Plus i-Sat is a cloud-based printing solution for large corporate data centres with remote locations, such as satellite offices, retail outlets, labs, or clinics. In these scenarios, there can be security concerns caused by satellite locations using VPN tunnels to access systems inside corporate firewalls. In addition, personnel at satellite locations often do not have the time, resources or technical know-how to support local printing systems. It is for these reasons that Plus Technologies developed the internet cloud-based i-Sat print solution. i-Sat is a product that can be deployed as a software program or a self-contained hardware appliance. i-Sat requires no expertise at the satellite location and is plug-and-play ready. The end user merely plugs the device into the wall and it performs all its tasks by itself. i-Sat connects through the internet to an OM Plus host at the data centre where it requests configuration information and configures itself. Once configured, i-Sat will regularly connect to the OM Plus host at the data centre to ‘pull’ all available print jobs down that are destined for the satellite location. No VPN connection to the data centre is required and all local printing at the satellite location is managed by i-Sat. Administrators at the host location can obtain print activity (statistics, metrics), as well as gain access to troubleshooting tools and recovery capabilities without having to be onsite at the satellite location. Healthcare organisations that support clinics and affiliates with the core EMR applications, such as Epic are good candidates for the i-Sat solution. I-Sat streamlines operations and is a significant cost savings and unlike traditional VPN connections, OM Plus i-Sat provides secure communications to both the remote satellite location, as well as the corporate data centre without being part of the data centre network. New i-Sat demo allows printing of live documents at your place.